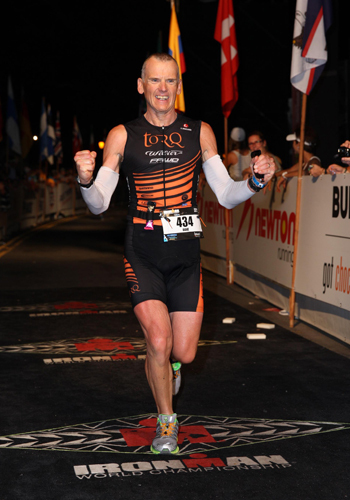 Time for my last race of the season and the biggest one of them all, the Ironman World Championship in Kona Hawaii. 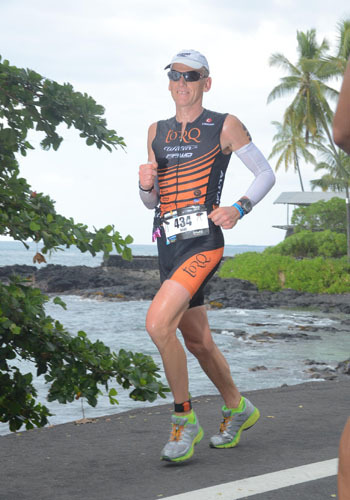 After a 3 year break, I was really looking forward to racing on the big island. 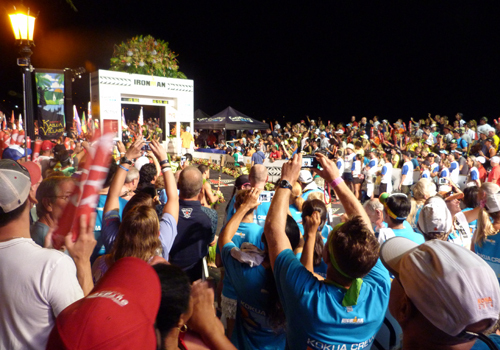 The big island has a population of roughly 150,000 and during race week up to 25,000 visitors descend on the island. Fortunately the locals seem to welcome and really appreciate the event being held on their island. We arrived on the Sunday evening, 6 days before race day.  As soon as you leave the plane you are immediately aware of the intense heat and humidity – it would take several days to get used to this incredible difference and to recover from the jet lag after a 24 hour journey. 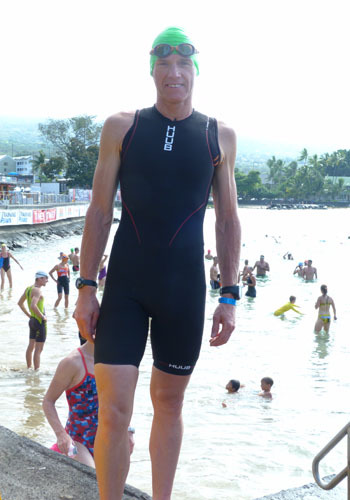 Heading down to Kona pier for swim practice on the Monday morning was amazing – to be mingling with the top pros together with lots of age groupers. Swimming in the sea in Kona is like swimming in an aquarium with lots of tropical fish passing underneath you and it is easy to get distracted; there was even a pod of dolphins swimming around me! Having got used to swimming in open water using a wetsuit, I found it a lot slower in just a tri suit, so I decided to use a Huub swim skin for the non wetsuit race day swim, which was certainly a lot faster. Training, especially running was very tough in the heat and humidity and it was essential to keep well hydrated. One of the pre-race highlights is the underpants run on the Thursday morning. As the name suggests, everyone taking part wears some form of undergarment and believe me there are some sights! Unfortunately TORQ don’t produce underpants (yet – JE) so I had to improvise! Over 2,000 people take part in this run, in aid of charity and jog for 2 miles to much cheering and support from the onlooking crowds. It is an excellent way of letting off steam before race day. Thursday evening was the Pre-Race Banquet, a very grand affair compared to the usual Pre-Race pasta party, where all the athletes were made to feel very welcome. Friday afternoon, the day before race day and time to check in the bike and bags. It always amazes me how fast the bike transition and finish line are set up. When you go to rack up your bike on the pier, you are escorted through transition by a volunteer, who walks you through transition and helps you get your bearings. 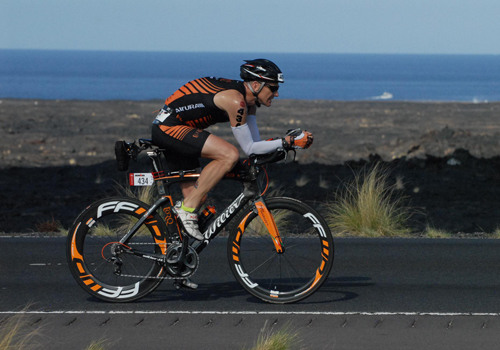 I was pleased to see that the orange and black Wilier twin blade with matching Fast Forward wheels, looked “arguably” better than a lot of the pros’ rides! After a good night’s sleep (for a change) it was time to party. After a 3.30 am alarm call, it was time to head towards transition in the darkness. The atmosphere was even more electric than usual. 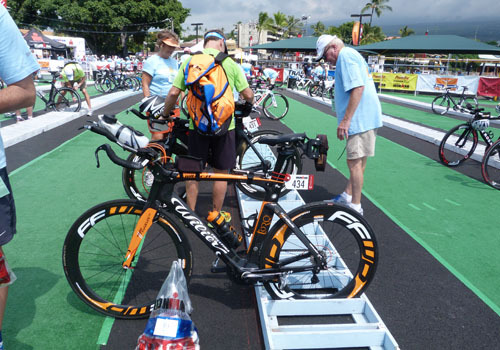 The Pros had a special cordoned off area in transition, but they seemed to be as nervous as the Age Groupers. The site of the swim entry onto Dig Me beach is very narrow, so it helped that there were 4 start waves – Pro Men at 6:25, Pro Females at 6:30, Male Age Groupers 6:50 and Female Age Groupers at 7:00. After the American National Anthem, the cannon went off and it was time to go. With the Female Age Groupers starting later, the swim start was noticeably less crowded. With the current behind, it made for a fast swim out to the turnaround point, but then you turned back into the current in choppy conditions. As everyone funnelled towards the swim exit, the last quarter of the swim became very crowded and I found it difficult to maintain any rhythm. I was very glad to exit the water and head towards transition. Going into the race, I had fitness issues (due to coming off my bike 5 weeks before the race) and still had a stiff right hip, where the grazes were yet to heal properly! So it was with some concern that I got onto the twin blade. For the first 20 miles of the bike, there was a tail wind which helped everyone keep up a fast pace. After that, the wind unfortunately turned and changed into a strong head wind and it became really difficult to maintain a good pace, especially on the 10 mile climb up to the turnaround point at Hawi, as temperatures were climbing into the mid 30’s centigrade. At the aid stations, I took care to take on plenty of fuel and liquids and had to pour water over my head to keep cool. After Hawi, there was a fast descent, but I had to take care, as I was battered by strong cross winds. After getting back onto the Queen K Highway, the wind had again swung around and strengthened, making the final 30 miles to transition a really tough ride. I headed towards T2 and was greeted by a massive cheering crowd! 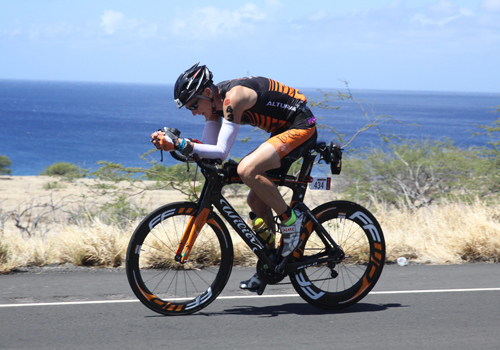 Out of T2 and starting the run down Ali’i Drive, the crowd support was fantastic, but I knew straight away the tough bike had taken its toll on my legs, so I eased up on the run. I kept a steady but slower pace, taking it easy through the aid stations to ensure I got enough nutrition on board and put ice in my run cap to keep cool. 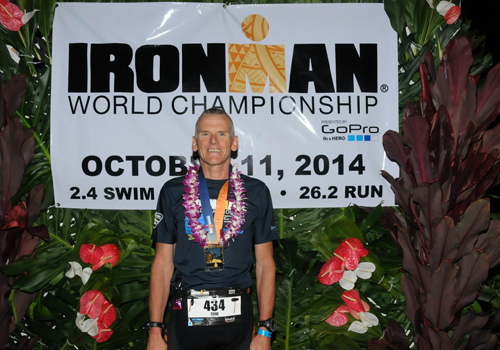 After a long season, I was really pleased to be able to go back to Kona and pick up my fourth finishers’ medal. So now it’s a case of having some down time to recharge the batteries, before the training starts again for next year’s season. 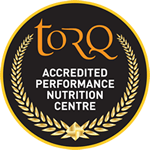 I must take this opportunity to thank all the team sponsors for all their help over the season and everyone at TORQ for their support.